Seattle federal judge halts Donald Trump’s Muslim travel ban. Protesters at Reagan National Airport on Wednesday. 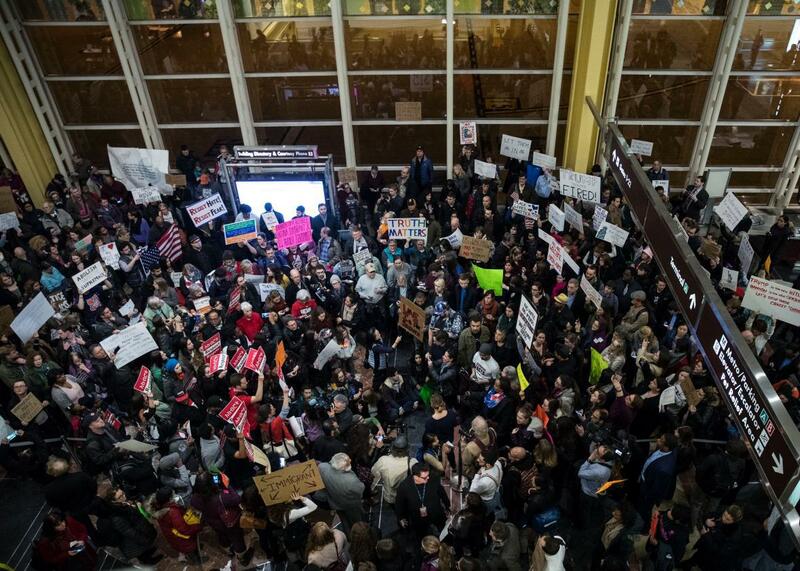 Update, 9:52 p.m.: CNN is reporting that Customs and Border Protection is reinstating revoked visas for travelers affected by the ban, indicating that the executive order is no longer in effect. On Friday night, in the most stinging and widespread rebuke to the new administration so far, a federal judge in Seattle ordered a nationwide stay on President Trump’s week-old executive order barring travelers from seven countries from entering the U.S., Reuters reported. Unlike the judicial orders already in place, the order entered by Judge James Robart (a George W. Bush appointee, in case you’re keeping score) went to the heart of the executive order, requiring that the travel restrictions be stayed immediately. Federal officers are barred from enforcing the parts of the ban that target immigrants from those seven countries and refugees and that grant exemptions to refugees on the basis of their religion. At the preliminary hearing Judge Robart pointed out that no terror attack has been carried out on U.S. soil by people from any of the countries in question. Robart’s order comes in response to a suit filed Monday by the state of Washington and joined by Minnesota—the first lawsuit to request that the entire executive order be halted until a federal judge can determine its constitutionality. Robart did not directly address the suit’s claim that the Muslim ban is unconstitutional, but he did find that the state had met the burden of proving that the immigration order would cause “immediate and irreparable injury” to the plaintiffs, and that the state was likely to prevail on the claim that Trump’s order was unconstitutional.